Cathedral Lake just outside of Aspen was a stunning view. The pristine lake coupled with colorful flowers and a jagged peak backdrop created a view that was just out of a book. 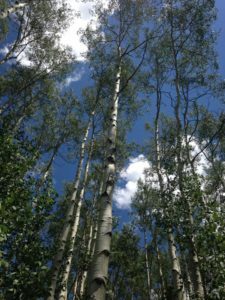 The aspen tree covered forest leading up to the lake was unequaled. 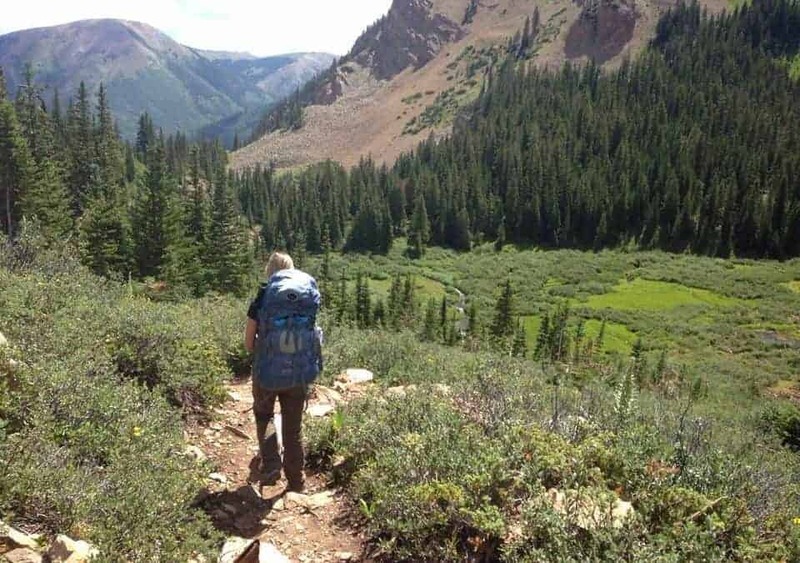 I would love to do this hike again in the fall when the aspens change color. We started Saturday morning without much of a plan. 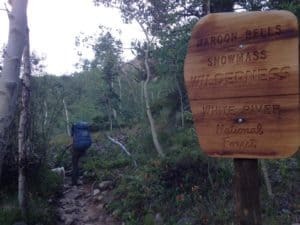 We knew we wanted to go up to the Leadville area, but had no set itinerary as far as a hike or campsite planned. So off we went with the pups and packs in tow. 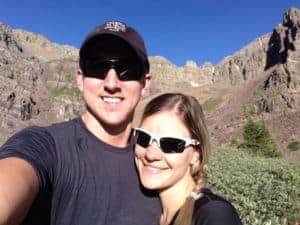 Once we got to Leadville, we decided to head up to Aspen, as neither of us had ever been, and we wanted to see Maroon Bells. 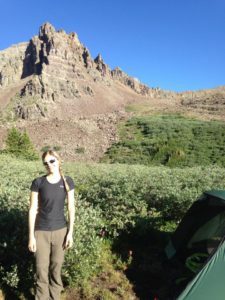 Our plan was to hike up to Crater Lake below Maroon Bells and camp. 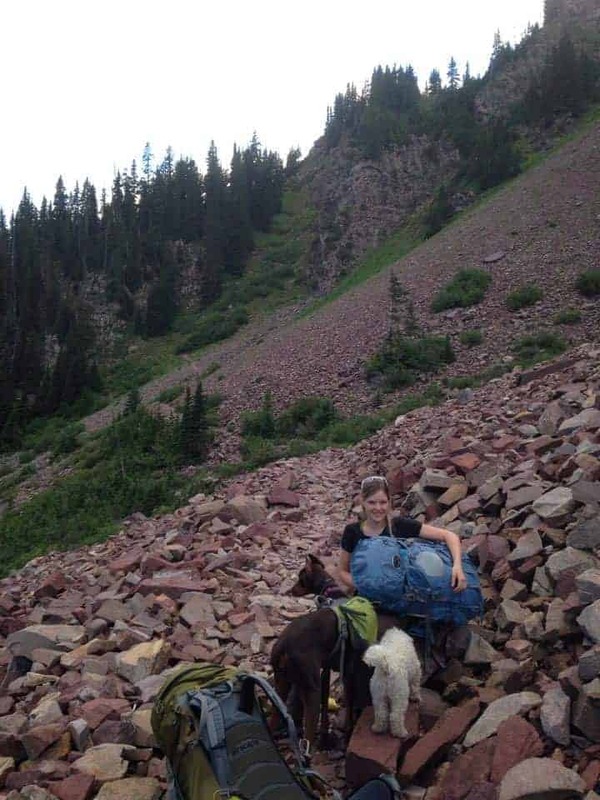 However, our plan was foiled when we found out that the road leading to Maroon Bells is closed during the day and you must take a shuttle to get to it. Of course, with the dogs, we didn’t feel that was the best plan. So we turned around and worked on a new plan. 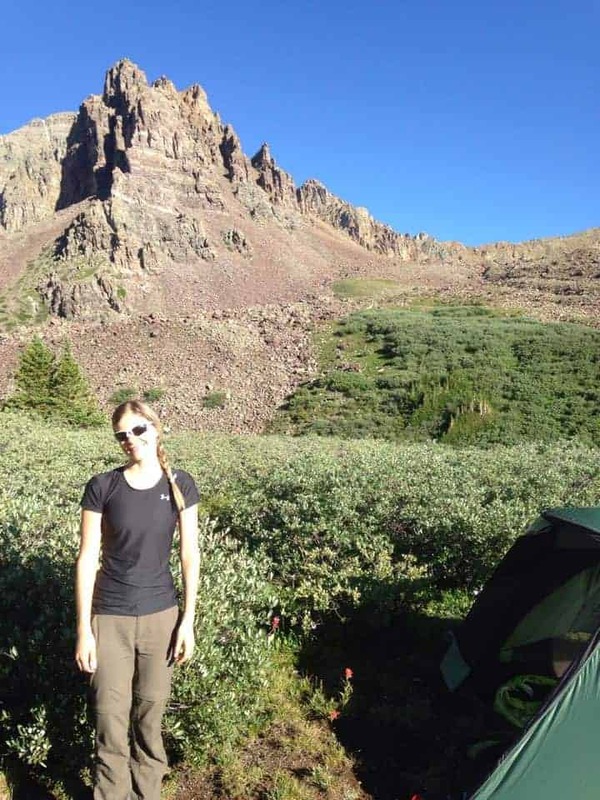 Since we were in the Maroon Bells – Snowmass area, we looked to short hikes nearby. 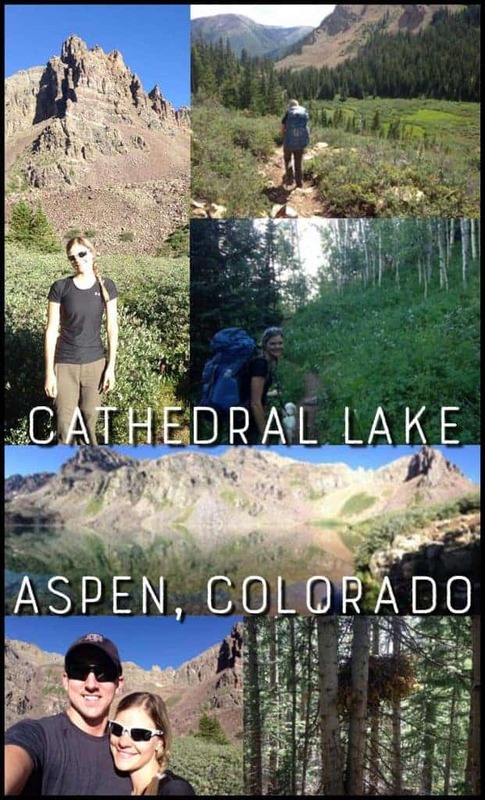 We found the Cathedral Lake and decided to try it. 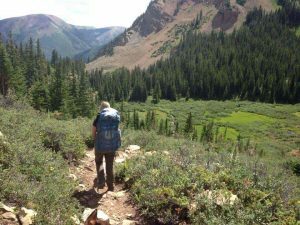 Cathedral Lake is about a 2.8 mile hike up a nice trail that gains approximately 2,000 feet of elevation from trailhead to the lake. There is also an option to split off the Cathedral Lake trail near the top and go to Electric Pass. We did not do this due to time constraints, but it appears to be a nice additional hike. 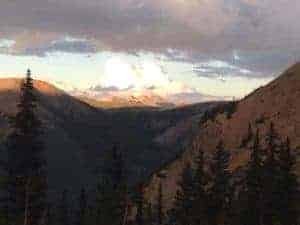 We began the hike late in the evening, close to 5pm, so we knew we would either not make it to the lake or finish the hike in the dark (headlamps were on the ready!). 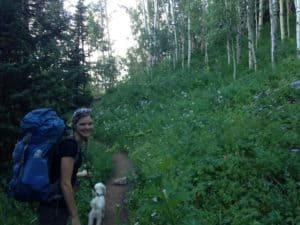 The beginning of the trail was slightly steep with a beautiful surrounding of Aspen trees and various flowers. A well beaten path, the trail itself was very nice and easy on the feet. The pups appreciated that, as they didn’t need their boots. About a mile into the hike, we stopped for a break. At that point, I spotted movement on the mountain north of us. A bear! It was a brown bear (as in, a bear that was brown), not sure of the species. About 400 yards from us, we were not concerned for our safety. 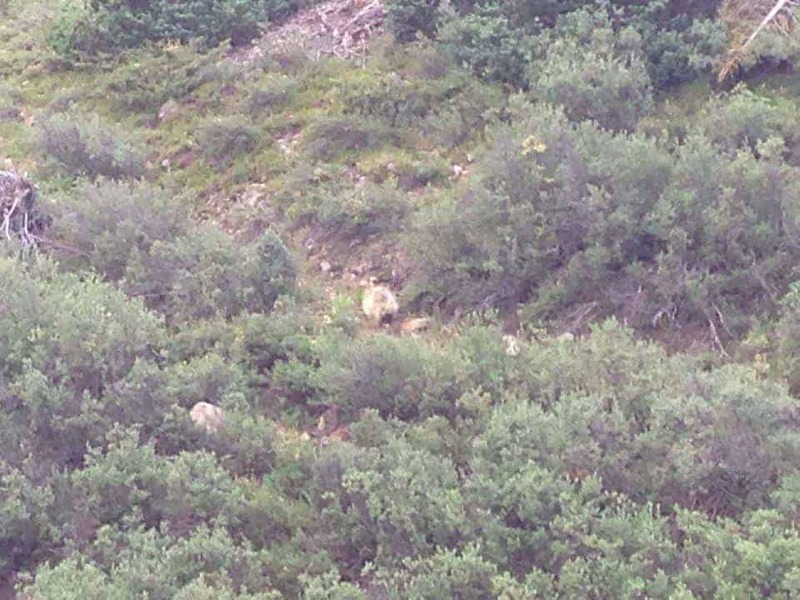 That distance (and the lack of a good camera) did prevent us from getting a good picture of the bear. It was a first for us and very exciting, though. 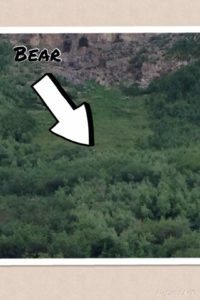 We watched the bear forage in the willows for about 10 minutes before we continued on our hike. Shortly after we saw the bear, we came to a little valley and there was a porcupine waddling up the trail. It was pretty big! From ground to top quil was probably every bit of 2.5 ft tall! A few more hundred feet up the trail Nate showed me what appeared to be a big birds nest about 8ft off the ground. 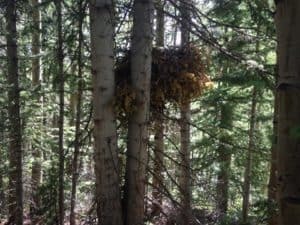 He told me it was a porcupine nest. I didn't believe him at first, but he eventually convinced me he wasn't joking. Who knew porcupines climbed trees! The bear sighting along with a lack of access to water on the trail urged us to continue all the way to the lake rather than setting up camp along the trail. So, on we went! The trail was a bit steeper (or I was just tired) going further up. We crossed two boulder fields and then arrived at the very steep, very short set of switchbacks that indicated we were getting close to the end of the trail. Prior to attempting those, we sat down for a quick water and snack break. The switchbacks honestly looked much more difficult than they actually were. Upon cresting the hill at the top of those steep switchbacks, there was an additional field of willows, then a small creek crossing. Past the creek, the lake was just a few hundred yards away. We arrived at Cathedral Lake around 8pm. It was a beautiful sight, even in the dark. The moonlight danced across the water and cast shadows along the willows from the mountains towering above. Using headlamps, we set up camp in a clearing amongst the willows. Exhausted and getting cold, we hastily cooked our dinner on our stove and headed to bed. It had been a tiring day, but it was well worth the effort. In the morning, we were excited to get out of the tent and see the beauty of Cathedral Lake and its surroundings in the daylight. We were certainly not disappointed! The lake was even more beautiful in the daylight, and the towering mountains above it provided the most gorgeous background. The jagged peaks lived up to the name, a natural tribute to a Gothic cathedral. We grabbed our stove and headed to the lake shore to have a hot cup of coffee and breakfast by the water. The clear water allowed us to see the large trout swimming by in the shallows. While enjoying our coffee, another hiker came down the trail near us. After some small trail talk we found out he was the owner of Protrails, a trail review and conditions info page. After saying a quick farewell, he headed off to get pictures of Cathedral Peak. The clear day allowed us to enjoy the expansive views across the range. Cathedral Lake was not disappointing. After a few hours of enjoying the views, we decided to pack up and head back. Being tired and sore, we knew it would take us extra time to get back to the trailhead, and there was rain in the forecast for later in the day. So down we headed. Because we started our hike so late in the day on Saturday, we did not encounter many other hikers on the trail. This was not the case on Sunday coming back. The trail proved to be quite the popular trail, and we were passing other hikers every few minutes or so. This was a little bit disheartening, because the heavy traffic discouraged me from wanting to return to such a beautiful site. 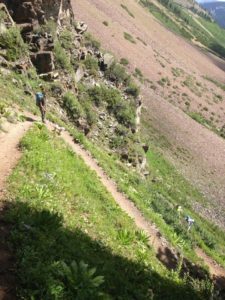 And that’s not to say that I don’t enjoy sharing the trail; it’s simply that not all hikers practice common trail courtesy and make it an unpleasant encounter. In all, the environment and the views from Cathedral Lake were beyond rewarding. I hope we will return to this site and continue on to Electric Pass. There are many other trails in the area that we will explore in the future as well.